SPRING CLASSES 2019 WEST HARTFORD ART LEAGUE (Two Sections) Wednesday Afternoons and Thursday Mornings. POP UP BOOT CAMP FALL AND WINTER SESSIONS WEST HARTFORD ART LEAGUE 2018 and FARMINGTON VALLEY ARTS CENTER 2019, AVON, CT. Date : Wednesday, November 28, 2018-Wednesday, December 19, 2018. Materials list scroll down this page and see below. If you try to register and you receive notice that it is filled, please put yourself on the waiting list and a second class could be added. BELOW THERE IS A GENERAL LIST OF THE MATERIALS I GENERALLY USE IN MY MIXED MEDIA CLASSES. PLEASE SCROLL DOWN THIS PAGE AND YOU WILL SEE THE LIST. ABOUT A WEEK BEFORE EACH CLASS I SEND OUT AN EMAIL DESCRIBING WHAT WE WILL BE DOING IN THE UPCOMING CLASS AND WHAT SPECIFIC OR ADDITIONAL SUPPLIES WILL BE NEEDED IN THAT WEEK’S CLASS. STUDENTS ARE ENCOURAGED TO BUILD THEIR MARK MAKING AND MIXED MEDIA TOOL-KITS AND MATERIALS OVERTIME. NEW STUDENTS ARE WELCOME TO EMAIL ME WITH ANY QUESTIONS THEY MAY HAVE ABOUT MATERIALS. A dynamic abstract "mark making and collage work out" for students (beginner to advanced) who would like to pump up their mixed media repertoire with exciting and innovative approaches to making Contemporary art. Emphasis will be on the language of line and spontaneity, chaos and control, figuration to abstraction, action versus quiet and the elements of good design. We will cover the nuts and bolts of mark making, exploring color waves, painting papers, creating textures, working in layers, using resists, exploring traditional and unique surfaces or materials and understanding and experimenting with a variety of products. Weekly assignments will integrate the use of wet and dry media, pen and ink products, painting and collage. Students will also learn about how to resolve artistic dilemmas disturbing, interrupting, camouflaging, cropping, embellishing and cutting up and reassembling work that goes AWOL. Group critiques and referencing noted abstract artists will be incorporated All levels of students welcomed. A materials list is available at: http://www.cdiannezweig.com/workshops/ A small materials fee will be collected in the second class. Abstract artists who would like to add more spontaneity to their artwork will explore a variety of mark making approaches to help reinvigorate and “morph” their contemporary styles into more interesting and finished works of art. 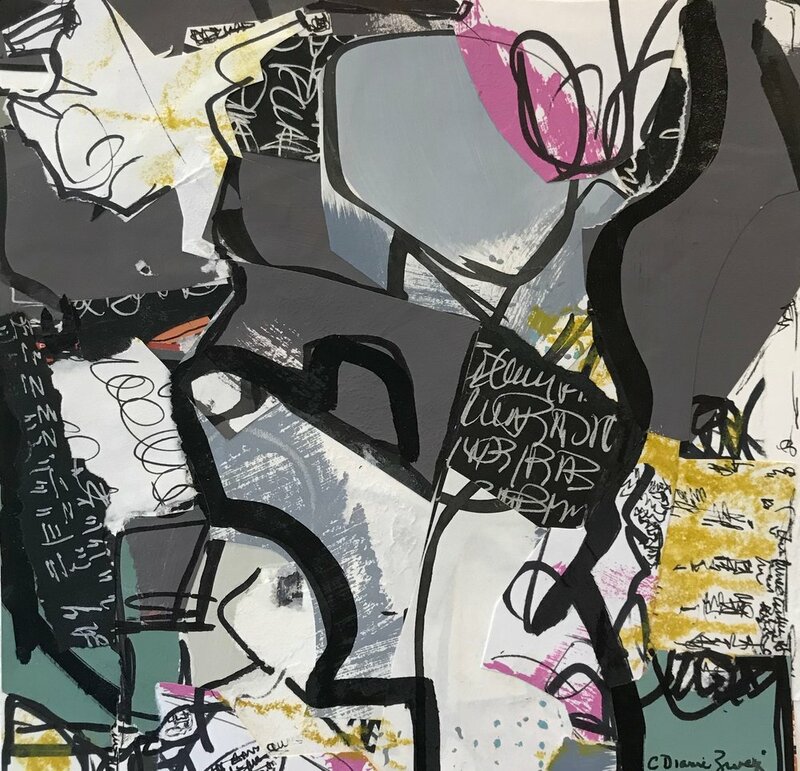 Emphasis will be on the language of line and spontaneity, chaos and control, figuration to abstraction, action versus quiet, color, and shape using both traditional and unconventional art products, materials and tools. Assignments will integrate the use of wet and dry media, pen and ink products, painting and collage. Emphasis will be on resolving artistic dilemmas in creative ways which incorporate innovation as well as group critiques. All levels of students welcomed. A materials list is available at: http://www.cdiannezweig.com/workshops/. A small materials fee will be collected in the first class. 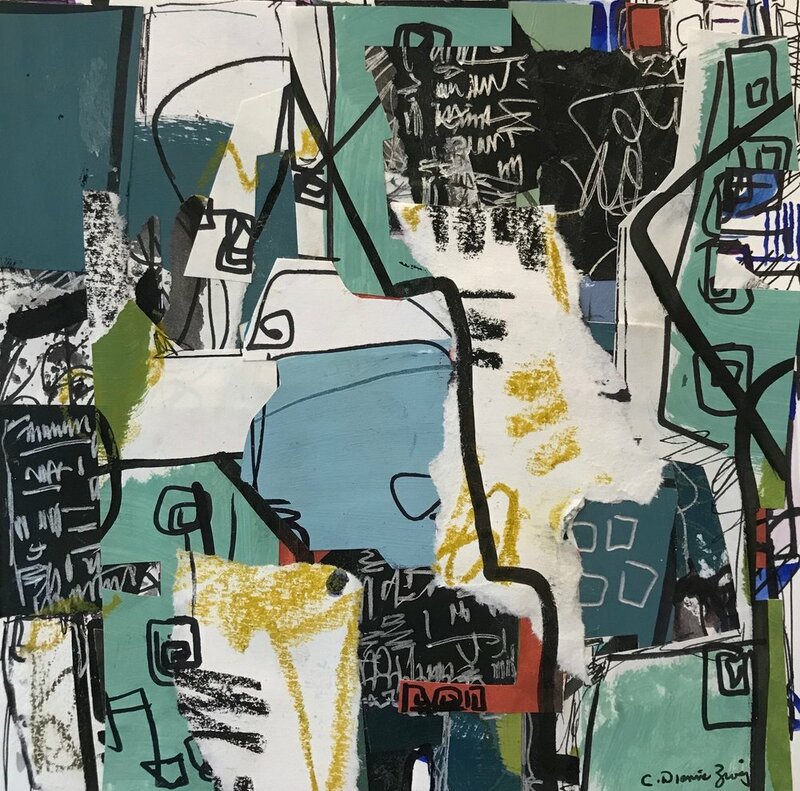 A four session dynamic abstract "collage work out" for students (beginner to advanced) who would like to pump up their mixed media repertoire with exciting, colorful, creative approaches to making contemporary art. This pop up course will begin the process of transforming participants into more confident and invigorated collage artists. During (4) three hour sessions, we will cover the nuts and bolts of working in layers, using textures, color, line and always evaluating the elements of design Students will also learn about disturbing, interrupting, camouflaging, cropping, embellishing and cutting up and reassembling work that goes AWOL. Class critiques will be included. A small materials fee will be collected. Fasten your seat belts, this exciting new class will appeal to artists of all backgrounds who love a modern vibe and want to channel nature and abstract Mid Century design. Picture the leaves, geometrics, colors, forms and shapes of 1950s- 1960s barkcloth textiles, wallpaper, clothing, home goods. We will reinterpret the colorful eras with Mixed Media projects that combine natural, organic and abstract elements. Emphasis will be on color, layering, mark making, textures, found objects etc. using dry and wet media on a variety of paper surfaces. Students will be encouraged to combine acrylic paints, watercolors, pastels, inks, markers, crayons and more. A perfect class for students who like variety and like to experiment with traditional and unconventional products and materials. Group critiques will be included in each class. Famous Mid Century designers and artists will be referenced in classes. We will work in a variety of wet and dry media with an emphasis on MARK MAKING. Bring some of what you already have, but wait till the first class to get more familiar with what you need before going out to buy new products. 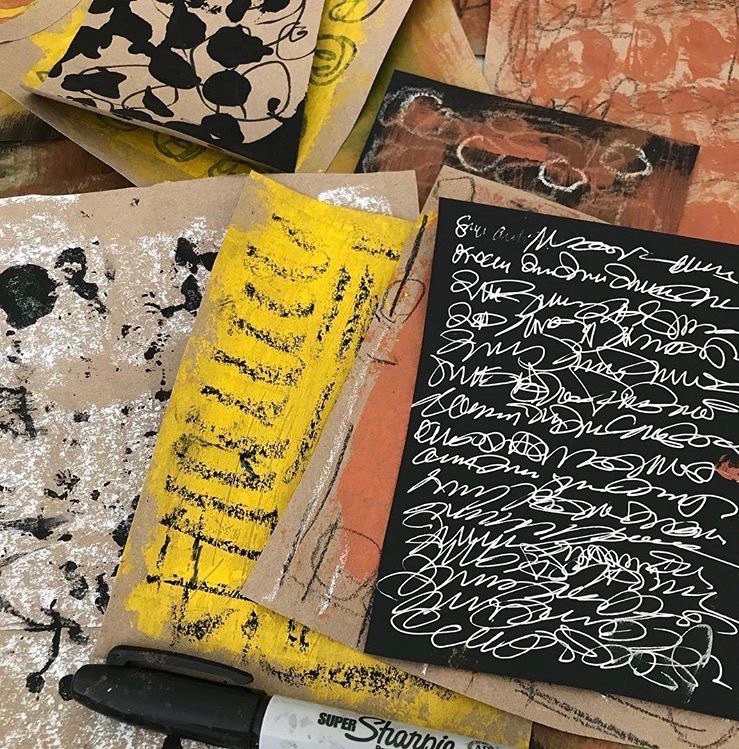 We will build materials and supplies as you discover new ideas but there are certain basics that you should always have on hand in your art toolbox for making a variety of marks and textures. DRY MEDIA: Black Sharpie markers or other permanent markers in a variety of tip sizes. Wax crayons (thin and thick); oil and chalk pastels; colored pencils; regular drawing pencils; charcoal. WET MEDIA: Acrylic paint (black and white) and other colors; Black permanent ink; Watercolor paint; Gesso (white). BRUSHES & BRAYERS: A variety of flat and round brushes in all sizes; sponge brushes; (Other "brushes will be discussed). Brayers are a nice addition to your toolbox. BTW, I also smear paint with old glossy post cards or card board that i fold to size or old plastic credit cards. SUPPORTS: Pads of Canson (or other) drawing paper in a variety of sizes. To be discussed. Arches water color paper (to be discussed). OTHER ESSENTIALS: Palette to mix paint, plastic container for water, paper towels, newspaper. TEXTURES: Other materials to collect and bring include products that can make textures such as mesh bags from onions, bubble wrap, corrugated brown packing paper that have different kinds of ridges, wallpaper that has raised texture, combs, inserts from candy boxes that have patterns and interesting surfaces etc. For information about individual or group workshops, email me. 6 Weeks Level: Beginner to Advanced Using a full range of both traditional and unconventional art products, materials and tools, this class will playfully explore the art of mark making using combinations of dry and wet media, pen and ink products, painted papers, printing, textures and masking techniques. This class is designed for both obsessive mark makers and artful doodlers who want to “morph” their contemporary styles into more interesting and finished works of art. Emphasis will be on resolving artistic dilemmas in creative ways which incorporate innovation as well as group critiques. We will work in a variety of wet and dry media with an emphasis on MARK MAKING. Bring some of what you already have, but wait till the first class to get more familiar with what you need. While I have my favorite products, you are welcome to bring to class what you already have and to build materials and supplies as you discover new ideas. My favorite essential materials are Canson Drawing paper (or similar) in a gummed pad (any size works); Sharpie Markers and a variety of paint pens (I can show you in class); Crayons (thin and chunky) oil pastels (thin and chunky) colored pencils etc. ; Acrylic paint (I like Liquitex Soft Body), Inks (especially black permanent), Fluid Acrylics. We will also experiment with wax, alcohol and other products that disturb marks. Other materials to collect and bring include products that can make textures such as mesh bags from onions, bubble wrap, corrugated brown packing paper that have different kinds of ridges, wallpaper that has raised texture, combs, inserts from candy boxes that have patterns and interesting surfaces etc. BTW, I also smear paint with old glossy post cards or card board that i fold to size. An exciting series of contemporary art classes tailored to meet the unique needs of aging older adults who still enjoy the creative process or who are being introduced to the arts for the first time in their later years. Designed to offer a creative workout for active older adults, participants will be encouraged to relax and experiment with art materials, products and a variety of styles in new ways. Taught by a professional artist with a special background in the needs of older adults, these classes are perfect for people who say "they can't draw or they don't like getting messy or they have no patience". On the other hand, mature artists who would like to continue the creative process will also enjoy these classes. Learn more about Dianne at http://www.cdiannezweig.com This class is geared for older adults living at home or in an Assisted Living or Independent Housing residence. Caregivers welcome to accompany registrants during class (at no additional fee) to assist participant. Must provide own transportation. Let Loose With Collage & Mixed Media: Leave your inner critic home and join others in the art of creating Mixed Media artwork and collages using painted papers, print making techniques, textures, mark making, dry and wet media. Emphasis on helping students “loosen up” and work more spontaneously with a variety of art materials and products. All levels of students welcomed. Day/Time: 4 sessions on Wednesdays 1:00 - 3:00, May 4,11,18, 25. Fee $120.00. Stay tuned for some exciting new workshops and classes tailored to meet the unique needs of aging older adults who still enjoy the creative process or who are being introduced to the arts for the first time in their later years. Special individualized and group programming geared for high functioning older adults as well as individuals with dementia and other special needs. Also planned are programs for caregivers and older adults. To encourage appreciation and participation in the arts in our surrounding communities, I have developed a series of programs called "Creative Escapes: Tea & Talk. Civic, educational, religious, social organizations are invited to sign up for "mini-hands-on workshop" or "art talks" which are taught by me or other instructors at community venues. For more information about suggested topics of programs available or to schedule a "Creative Escape" for your group information please email me. Artist Dialogues is a series I facilitate for established artists who want to stretch their existing way of working and exchange ideas and skills with colleagues. Inspired by the book "Steal Like An Artist" by Austin Kleon a group of artists convene monthly and are challenged with an "assignment" which could be to make a piece of art which may be out of their comfort zone or a project which introduces a new product etc. Other programs might include an art excursion to a new gallery, or a book review of a new provocative or professional topic etc. While I start the ball rolling, as the group settles in, others in the group may decide to take on the facilitator role or we might invite a guest leader. To learn more about "Artist Dialogues", please email me. I conduct individual and group classes and workshops for adults, adolescents and children. 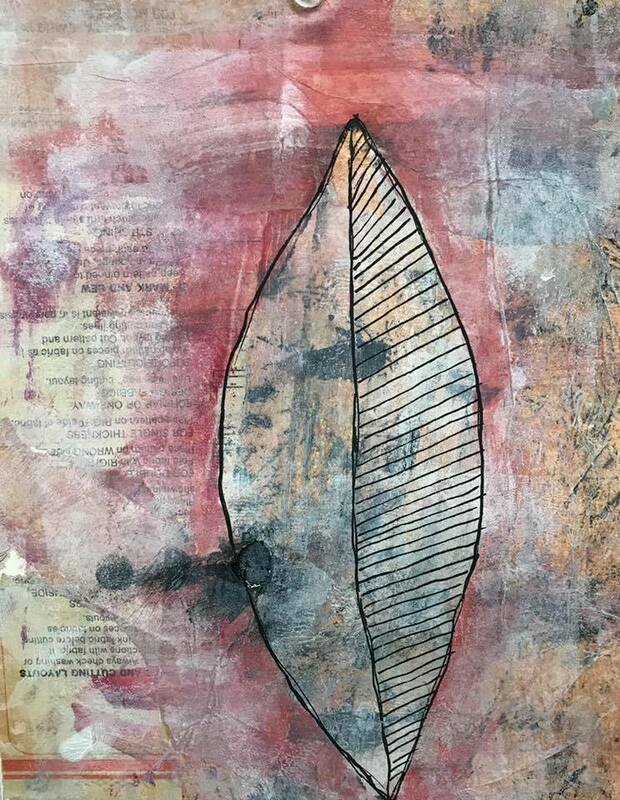 My emphasis is on helping the participant learn how to loosen up and experiment with a variety of materials and products that are the core of a Mixed Media artist's repertoire. What Is It Like To Take A Class? My classes can be described as both playful and yet focused, as students tinker around with everything plus the kitchen sink ! Work sessions include using paint, inks, pastels, markers, resists, textures, rubbings, mediums, adhesives and more. I enjoy demonstrating the use of both conventional and unconventional tools when making art. Together we will work towards creating art that compliments your individual style and yet reinforces the principles of composition and design. Classes will build skill in the effective use of color, line, shape, form, texture, contrast, movement, balance, rhythm and unity. Group lessons allow for sharing ideas and peer critiques of work. For information about individual or group workshops, please email me.